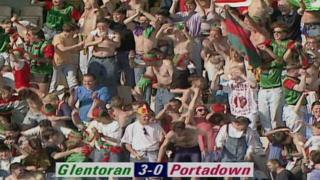 A look back at the Irish Cup final between Glentoran and Portadown 25 years ago as the teams prepare to meet in Saturday's decider. George Neill, Stephen Douglas and Raymond Morrison were on target as the Glens enjoyed a 3-0 victory at Windsor Park. Portadown had the consolation of winning the Irish League title in the 1989/90 season.